An Easter Basket for grown ups! 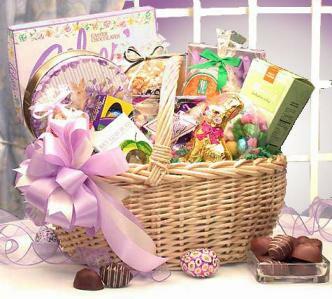 Deluxe Easter Gift Basket. Who says Easter baskets are all about the kids? Share this special basket with a loved one in your life. Your basket will show them exactly how special they are and just what they mean to you. This gift includes the following: Assorted Double chocolate cream truffles, Easter Gift Box filled/ Fudge Brownies, Fudge Filled chocolate Easter Eggs, Key Lime Sour Drops Candies, Smooth & Melty Mints, Milk Chocolate Foil Easter Bunny, Deluxe Easter candy corn, Spring Butter Mints, Buttercrunch, Caramel Corn, Easter Peeps Marshmallow bunnies, and Almond lemon cookies all in a Willow Basket.